Step outside the corporate takeover of our experiences, and enjoy the real Panama City Beach. Gorgeous beaches with the gleaming white sands the region is known for have made Panama City Beach an extraordinarily popular vacation destination. However, it is still possible to enjoy this not to be missed Bay county destination the way it was meant to be experienced. Just think outside the corporate box when it comes to planning your vacation. Enjoy a different view of the natural beauty and local culture. A Panama City Beach vacation rental home offers a more authentic experience than the corporate hospitality industry ever can. If you know where to look you can avoid the overdeveloped areas and tourist traps, and enjoy the real Panama City Beach with its little hideaways that the locals know and love. Shell Island offers an authentic beach experience, its rugged beauty well complemented by the glistening white sands this region is known for. Bring your own supplies when you visit, because the beaches of this island are unspoiled and undeveloped. The snorkeling is excellent, and the natural state of the beaches makes them ripe for exploration and adventure. The Panama City Beach area is a great place for up-close dolphin experiences, boat rentals, fishing tours, parasailing, and numerous other water activities. Aquatic Adventures is one of several outfits that can help facilitate a variety of exciting experiences, offering activities suitable for a variety of age groups and skill sets. Other local activities include aquariums, theme parks, a zoo, and the beautiful Saint Andrew's Park. After a full day of adventuring, your Panama City Beach vacation rental home will be just the right place to rest and rejuvenate. Or, you may want to stop in for a nap and a bit of freshening up before heading back out in pursuit of a bit of culinary adventure. There are many dining choices in the area that offer authentic local and ethnic cuisines. Seafood fans won't want to miss the Sandbar Seafood House and Deli. It's a small place, and can get a little hectic during busy times, but the food is great and affordably priced. For Indian, Greek, and Turkish food, the Kabob House is the place to eat. Another small, some would say hole in the wall, sort of place, the food is authentically prepared, offering a real culinary experience. Portions are generous and the prices are well within reason. Shan Kishi is a tiny place fast becoming a local favorite. It's a great place for sushi and other Japanese dishes. Before there were corporations, there were people. 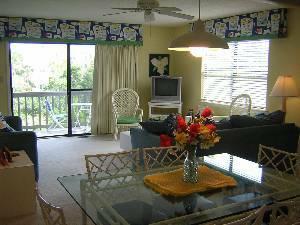 Take your next vacation out of the realm of the ordinary, and browse Panama City Beach vacation home rentals available for rent by owner. You'll be surprised at just how much more convenient, enjoyable, and authentic your vacation can be. Leave aside the bland, pre-packaged corporate vacation. It's time you got to experience a real Panama City Beach white sands and warm, emerald green waters vacation, with all the local flavors and fascinations of this gorgeous Florida region. Interested in More Panama City Beach, Florida ? Check out nearby Dune Allen Beach , Lake Powell , Santa Rosa Beach , Seacrest , Seacrest Beach , Seagrove Beach , Seaside .